The Tools & Services in your AJIBOYE Monkey Business Agency Partner Account. In the Management Partner Program, you are the captain of your enterprise. 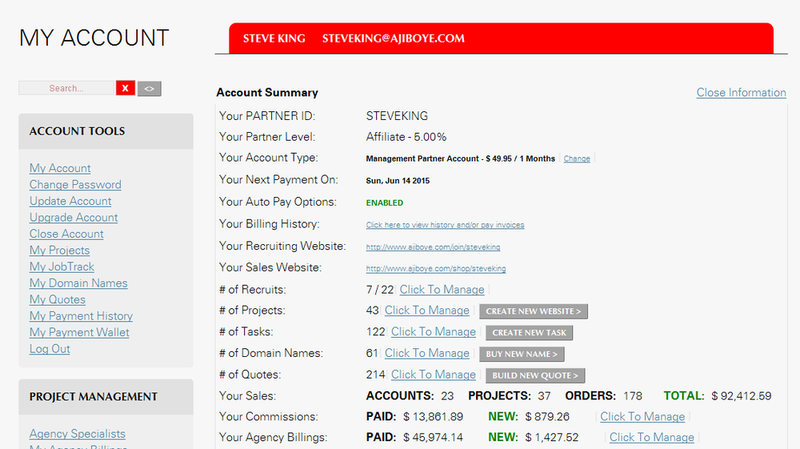 Login to create quotes, do work, log time, track income, manage your salesforce, get paid and more. Log into your account for everything you need to do your work and build your business! The Account Summary provides vital stats and quick access to all the critical points of your business. Go to My Projects to view and manage all your projects, and JobTrack to view tasks, complete your work and log your time. People you sponsor are your Salesforce. You earn 1% Sponsor commission on their activity. Keep an eye on how many Accounts you own, and how much revenue they are producing. You earn 5% commision on this activity. You will find records of all earned commissions on My Commissions. Commissions are paid automatically every month. You will find records of your weekly agency billings on My Agency Billings. Payroll is paid automatically every week.